My family owned one of the Maidrite Sandwich shops it started in the family in the 40’s in Independence,Ia starting with my great grandfather-grandfather-mother-uncle. We provided ketchup but if my grandpa would have had final say we wouldnt have either, his story was he was told from a food distributor that ketchup was going to go sky high for some reason and they should stock pile so he did, and prices didnt change so he was mad as heck!! I also worked there when I was in high school so I would be the 4th generation. I have many fond memories!! Hi Tori! What a neat story! I’m a little addicted to ketchup so I would have probably ended up trying to eat it all before it expired 🙂 I bet he was mad when he was trying to be proactive and it ended up never happening. Thanks for sharing. I hope you enjoy this recipe! I remember Friday night at the Maid-rite on First Ave. West in Cedar Rapids, Iowa. Been a long time since I tasted a good sandwich. Really anxious to try this recipe. My mom and dad grew up in Iowa but I never lived there. They moved to Colorado first, where I was born, then to western NY where I spend most of my life. My mom used to talk about “made rites” but I had never heard of such a thing because it just wasn’t a term used there! Hi Penny 🙂 I really hope you enjoy this recipe. We have loved it for a long time in our house and being an Iowan, they make me happy 🙂 Enjoy! The two things we miss from Iowa are maid-rites and fried pork tenderloin sandwiches. Whenever we return home, we know the first truck stop to serve tenderloins. Thanks for the recipe. My husband will go ape!! My parents owned a drive-in restaurant in Eldora. My favorite was our pork tenderloin sandwich with mustard, onion, and pickles. The pork tenderloin at Culvers is just like it. Julie, Lynn and John that is not a Maid rite in Greenville, that is Tastee, and they are different. I grew up on Tastee’e in Lincoln where they just closed their last one. Now the one here is Sioux City is the only one left. They were the only 2 cities to have Tastee In & Out. From Sioux City…Taster’s are the best! And the onion chips, of course. Since it’s maid (made) in IA, how come it is not ground PORK instead of ground beef? Also, can anyone please pass the Manwich sauce so I can finish the sandwich (it’s ultimate destiny is really to become a sloppy joe). Back when the Maid rite started ground pork wasn’t used much. If you enjoy the canned version of a SJ sandwich, you probably wouldn’t care for a pure loose meat sandwich. Iowa has a large cattle industry also. wouldn’t want to ruin a good maid-rite with MANWICH. we had one in Trenton Mo. quite a few years ago! Yum Yum! I still try to make it for my husband but just can’t get it quite right. And now I am frustrated because I can’t figure out how to print your recipes! My hand is broken and I can’t right very well but by golly I am going to try! Thanks for sharing! Hi Cindy! I hope your husband enjoys this recipe. I’ve always been a little picky about my loose meat sandwiches and this is about the only combination I’ve made that I can enjoy without adding something that keeps it from being a Maid-Rite. If you look right below the post and above the comments section (on any of my posts) you will see “buttons” to click on to share the post on multiple social media sites plus a “Print Button”. Hopefully that helps and hope your hand is better soon! The Talk Of MaId Rites And Pork Tenderloin Sandwiches Has Made Me So Homesick. 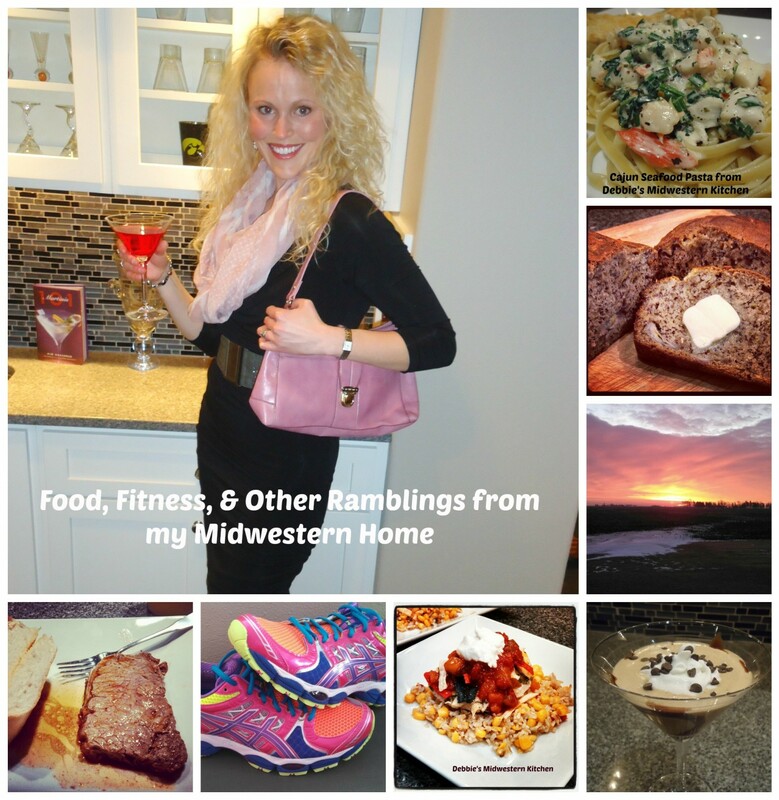 lots of Great Foods And Great Memories Attached To Those Foods. Hi, that was my grandparents’! They were just pure meat, not all the additives. My cousin Sandy Taylor still runs it. Thanks for the fun memories. Hi Nancy! Wow, that is so neat that you have such a close connection to Taylor’s Maid-Rites! I think I’d have a lifetime supply being shipped to me if I were in your shoes 🙂 Hope you’re able to enjoy them every now and then. Thanks for sharing! Nancy, thanks for telling others that it was just the meat. I feel like it has been my life long duty to tell people that it is just meat, nothing else. I worked at Taylor’s in 1969 and ’70 and loved every minute of it except when I pulled the metal tub of 73 lbs. of pure ground beef off of the floor scale and right on to my big toe! Ouch. Yes Nancy, I agree…just pure meat…nothing else but some finely chopped onion and i Mean finely chopped…S&P.. But…u must STEAM ur hamburger with the onion. 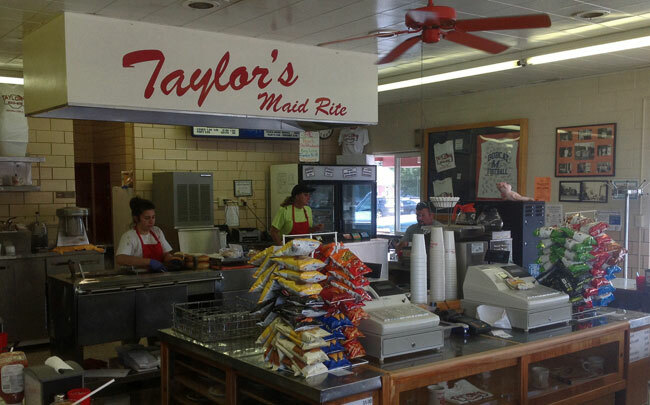 That’s it… I lived in Mtown also and enjoyed Taylor’s maid rites quite often. Another MUST is a shake to accompany the maid rites…oh and chips..lol Try it my way…u will TASTE the resemblance! My grandmother brought the Maid Rites franchise to Ft Smith Arkansas for her burger restaurant and that’s when I had my first. The best ever! But someone opened a new one just recently in Ft Smith and it just didn’t have the same favor so I wonder if they changed the original ? Loved reading your article. Thanks for the sweet memories! Hi Linda! I’ve read that the new chains that have spread across the country use a different recipe than the original so I’m sure they taste different. What a neat story about your grandmother! I’m glad this article was able to bring back some fond memories 🙂 Enjoy! Debbie, The new owners no longer use “fresh” meat. It is imported as a premixed mass from another state. Such a shame it had come to that. Marshalltown is the only “original” recipe left that I am aware of. The “powers that be” tried to get the Marshalltown Maid-Rite to change how they mixed their Maid-Rite’s but there was such an uproar about it that they gave up. From what I understand, they were told to stop mixing the raw ground meat close to the cooking meat. Not sure that was actually the case but that is what I seem to remember. A lot of the newer Maid-Rite places now serve a lot more than just the loose-meat sandwiches. Just doesn’t seem right though. Love your crock-pot recipe, it’s the closest to the real thing without going to the restaurant! Sandie – Thanks for sharing that information. Very interesting! Glad you enjoyed the recipe! Can’t wait to make these. I was born and raised in Iowa, but have since moved away. I loved maid rites! So do you put the hamburger in the crock pot raw or cook it first? If don’t cook first and drain off fat, would probably need to use really lean ground beef? 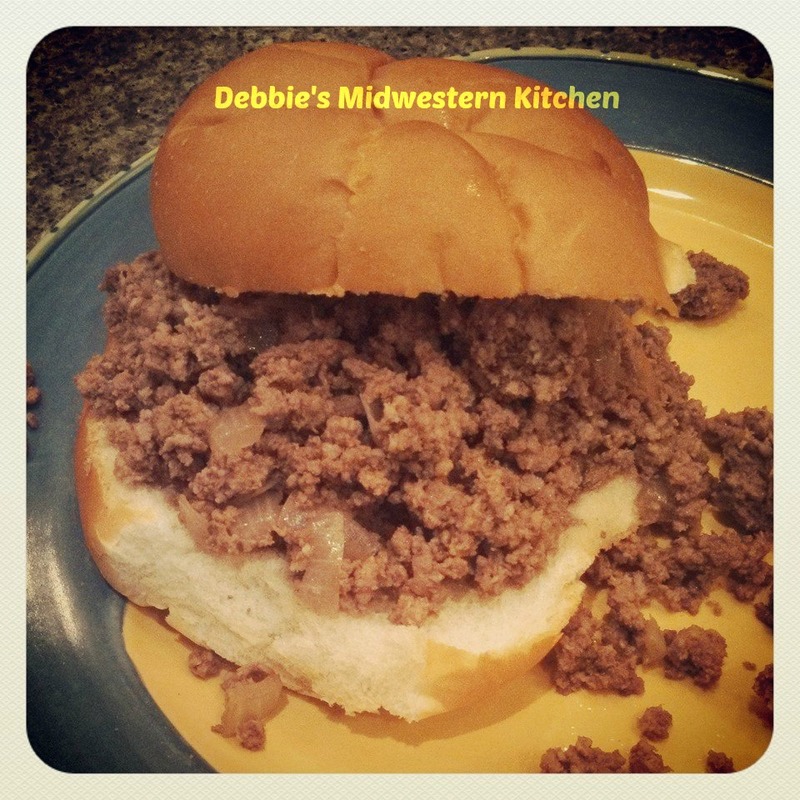 Laurie – I use the leanest ground beef I can find and put it in the crock pot raw. So easy! Enjoy! Many of Illinois recipes are cooked on a flat top grill, slow cooked for several hours. Main condiments are mustard and onions and pickles! I go back to a Maidrite in DuQuoin, Illinois for my first taste of Maid Rites!! I grew up going to Canteen Lunch in the Alley in Ottumwa Iowa. and I always ordered my sandwich ketchup and onion only. The other ingredients might add some delicious flavor but all you really need it the hamburger, the onion, and the water. Linda- Looks delicious! Thanks for sharing! So sorry, need a spellcheck button… I meant draining. I’d love to try this, but I’m worried about the fat in the ground beef. What % ground beef do you use? Hi Meg! I use the leanest beef I can find, usually 93/7, and I have never had a problem with the fat. Hope you enjoy this recipe! I remember my mom stopping at the MaidRite in Seymour, IN to get my uncle a sandwich. It was a part of the greyhound bus station and she remembered it from her days working at Freeman Army Airfield during WWII. She got off the local bus there and would sometimes get food to take home (she stayed with her uncle who was the Chief of Police). we enjoy a new store now in Peoria, IL with my daughters. I enjoyed the comments above, However, I do feel the need to add that yes Fred Angell did begin the Maid-Rite chain but it was first served in Muscatine Iowa, the true home of the Maid-Rite sandwich. Oh, and yes, ketchup is NEVER served on a Maid-Rite! Is there a way to copy these recipes??. I grew up not far from Perry, Ia. We were fortunate enough to have a maid rite there for many years. I’m anxious to try the crock pot version. I had a coworker who grew up in NW Iowa and they called them Taverns. Enjoyed reading the Maid – rite stories. I like mustard too! Maid rites with Sterzings chips with baked beans…. Burlingtonian living in Tx and needing a maid rite right now!!!! I grew up in Sioux City just blocks from the Tastee In and Out. Have been having loose meat for years but our family recipe had ketchup, chili powder, and onion. Made it 2 nights ago. I grew up in Milford, NE and never experienced Maid Rites until I met my wife who is from Marshalltown. (In Nebraska we have “Runza’s” which I think alot of people know about too). I’m also a ketchup on everything guy too, and always will be. I do get the evil stare from all of my wife’s Iowa family, but I think they have decided to just let me have my ketchup. My wife and I have been married for 20 years this past April and now I look forward (so does my wife) hitting the Maid Rite in Marshalltown when ever we get back there. I am going to try your recipe tonight on my wife. She doesn’t know about your article yet, at least I don’t think she does??? Thank you again for the recipe… Sincerely “A converted Nebraskan”!!! Did your recipe go well and taste like the ‘real’ maid rite? Heather – I hope you enjoyed them!!! Just put these in the crockpot. I’m excited to try them! I live in Iowa, so not a stranger to the maid rite, but I’ve been trying to find the perfect recipe to make them myself for years (the originals are delicious, but definitely a diet splurge… I just know they’re not using 93% lean!) They are already smelling delicious. Thanks! Alyssa – I hope you enjoyed them! If you double or triple the recipe do you have to cook longer? Jolene – I have never doubled the recipe, but I’m sure you would have to cook it longer. I’ve never experimented with it so I’m not sure how much longer…maybe an hour or two? 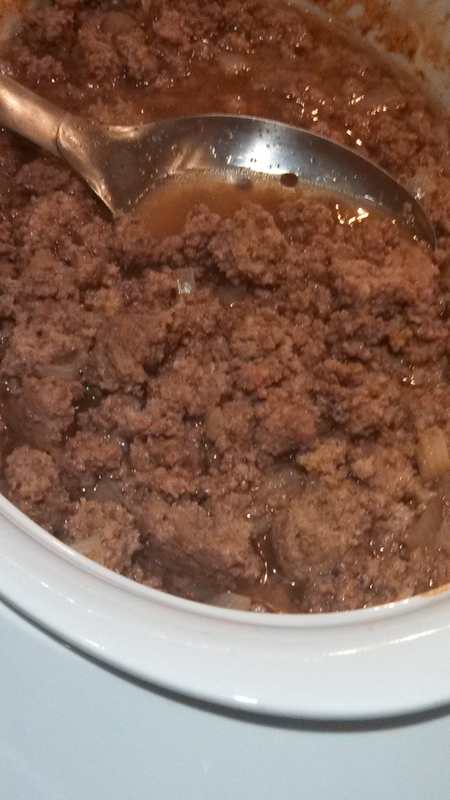 Do you cook the ground beef before putting it in the crockpot with the other ingredients? Sandy – No! That’s the great thing about this recipe…its so easy! Just throw the raw meat in with all the other ingredients. Enjoy! Before we lived in Iowa we would visit my husbands gram in Muscatine. A stop to the Maid Rite store was always on the list. My family will LOVE these – thanks so much for posting the recipe! I USED TO GO TO THE MAID-RITE LOCATIONS IN CEDAR FALLS & WATERLOO. I’m from northern Iowa and I can remember having the best maid-rites at the Franklin County Fair, served up by the 4H kids, they probably used a similar recipe. And I’m like you, love the ketchup!!! Grew up in Creston, Ia and I think when mom and dad would pick these up on Saturday night they were like 10/$1.00 and we loved them. Along with the pork tenderloin sandwiches the ONLY thing you eat on both of them is mustard and pickles and you dye-hards that like onions. THE GOOD OLE DAYS!! Can’t wait to try them using your recipe. Peggy – I hope you enjoy it! Up here in NW Iowa they are usually called Taverns. My understanding is that name originated from a bar & grille in Sioux City back in the 40’s or so. There is still a Maid Rite in Lexington, Missouri, my neighbor here in Kansas City was the owner then sold it and retired and moved here. I went to his and his wife’s funerals which were held there and ate at the Maid Rite both times. It was a wonderful dining experience. It is a fifty mile drive one way but I try to go back every summer for lunch!!! I am really excited to try your recipe. I have tried to come up with my own over the years without getting it quite right. One year I had Taylor’s Maid Rite shipped to me. I told my adult children about the hobos and the ketchup bottles and they couldn’t stop laughing! Tom McEvoy was an early partner in MaidRite. He took the process to Wichita and started NuWay in 1930. NuWay is still there and they are great. Debbie – My stomach is rumbeling already. I remember when our mother would take my sister and I to Sioux City, IA from Des Moines on a weekend to visit our grandparents and other relatives. This was in the 1950’s – 1960’s before their were interstates. So we had to work our way up to Highway 20 and over to Sioux City. The highlight of the trip was the return – we would plan to drive to Perry, Iowa for a Sunday dinner stop – at the Maid-Rite! Where the sandwiches were always made right!!! Thanks for the memories. Looking forward to trying your recipe. Steve – I hope you enjoy it! I always loved the maid-rite! Have to have ketchup! Living in New Mexico…..no body likes them! I still make them for myself and indulge!